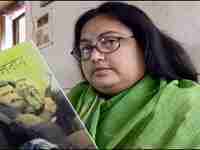 This article is about the book, Kabuliwalar Bangali Bou ( A kabuliwala’s Bengali Wife) and its author Sushmita Banerjee. This book was written by Sushmita Banerjee in 1997, after she escaped for the Taliban of Afghanistan in 1995. Before that Sushmita married an afghan businessman Jaanbaz Khan and changed her name as Sayeda Kamala. She went to Afghanistan with her husband. Kabuliwalar Bangali Bou ( A kabuliwala’s Bengali Wife) on her experience of marrying an Afghan and the time she spent in Afghanistan during Taliban rule. Later she was shot dead by Taliban on September 4, 2013, Paktika Province, Afghanistan when she returned there. The Bollywood film Escape from Taliban was made on her story.